The CMC Bugatti T35 is widely recognized as a fantastic piece of 1/18th scale modeling. Exquisite materials and finish make this a must-have for your collection. The Bugatti T35 also has some significance to me. Some years back, I spent an entire weekend at Lime Rock’s Vintage Festival staring at a full-size Bugatti T35 just feet away. As a vendor in the flea market, sellers are mixed in with the occasional competitor in the tight paddock 2. The Bugatti next to us was pristine in its well-worn patina, well ahead of its time in hipness. Its driver flogged the heck out of it too, apparently unaware of the car’s value. What burned a hole in my memory was the safety wiring along the lower part of the chassis. As someone who has done a lot of safety wiring, the Bugatti’s example was way over the top. The safety wiring extends down both sides and over the top middle of the car. How incredibly long that must have taken the Bugatti mechanics, I thought. 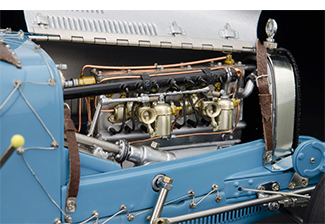 How incredibly well CMC has duplicated that wiring on their Bugatti T35 replica. I say replica because you almost feel as if you could fuel the car through its removable gas cap. Test the rear brakes with the working external brake lever. Gently spin the front crank. Undo the leather hood straps, so realistic with delicate working metal buckles. Roll back the thin hood on the right side, but not before looking through all of the perfect hood louvers. I suggest the right because while you can open both sides, but you’d have to remove the spare tire first (you can), it too secured by leather straps. The engine compartment is resplendent with fine photoetch, some of it turned metal. Rotate the steering wheel and watch the steering box work the front wheels (eventually). Copper plumbing, very fine brass or steel appearing parts, as well as very well done fine plastics. Throughout the range of CMC Bugatti T35 models, you’ll find countless fine rivets and more detail than you’ll notice first or second time around! There’s a faired-in mirror that reflects very well. The pivoting windscreen is secured by more leather. The oil pump lever goes up and down, the gear lever pivots. And on and on. I acquired the CMC Bugatti T35 England model a few years back. It replicates the English-green Bugatti that won the 1929 Monaco Grand Prix. Also a racing art lover, I was already admiring a print from that race by Alfredo de la Maria (left), which I subsequently acquired. It displays beautifully with the CMC model, and gives context to the model as well. It’s the green #12 behind the yellow car. The model and the art pair well, so to speak. In the same spirit of pairing, a trio of prints for you to consider. 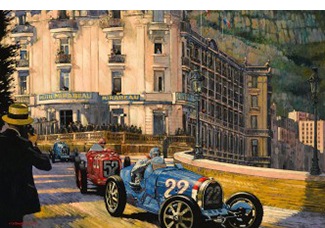 All are great period pieces that show the beauty of Monaco in the early days of the race. 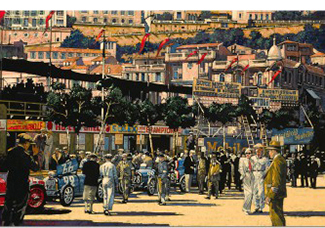 They add background and context to the beauty and realism of the CMC Bugatti T35. 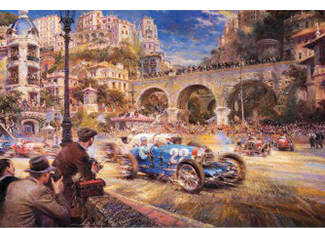 At left is Alfredo de la Maria’s Pur Sang des Automobiles. 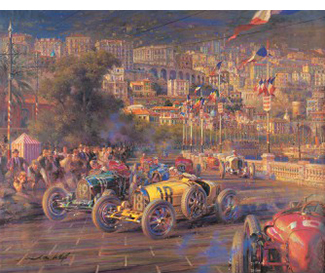 Middle left is Barry Rowe’s Monaco Style 1930. Bottom left is Barry Rowe’s Hotel Mirabeau. The CMC Bugatti T35 models can be found at the usual outlets like Replicarz and Mint Models, among others. You can find the Alfredo de la Maria prints at his website and Barry Rowe’s work at his website. Both are carried at Historic Car Art.